A 48-million-year-old fossilised leaf has revealed the oldest known evidence of a macabre part of nature – parasites taking control of their hosts to turn them into zombies. The discovery has been made by a research team led by Dr David P Hughes, from the University of Exeter, who studies parasites that can take over the minds of their hosts. All manner of animals are susceptible to the often deadly body invasion, but scientists have been trying to track down when and where such parasites evolved. Dr Hughes, from the University's School of Biosciences, said: "There are various techniques, called a molecular clock approach, which we can use to estimate where and when they developed and fossils are an important source of information to calibrate such clocks. "This leaf shows clear signs of one well documented form of zombie-parasite, a fungus which infects ants and then manipulates their behaviour." 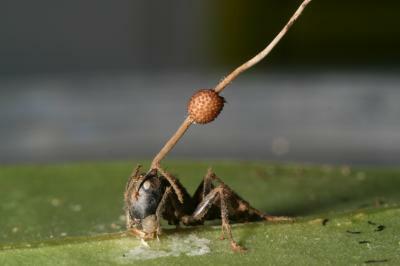 The fungus, called Ophiocordyceps unilateralis, causes ants to leave their colonies and head for a leaf which provides the ideal conditions for the host to reproduce. When it gets there the ant goes into a 'death grip'– biting down very hard on the major vein of a leaf. This means that when the ant dies, its body stays put so the fungus has time to grow and release its spores to infect other ants. The death grip bite leaves a very distinct scar on the leaves. This prompted Dr Hughes, together with research partners Conrad Labandeira from the Smithsonian Institution in the USA and Torsten Wappler, from the Steinmann Institute in Germany, to search for potential evidence of the fungus at work by studying the fossilised remains of leaves. Dr Hughes said: "The evidence we found mirrors very closely the type of leaf scars that we find today, showing that the parasite has been working in the same way for a very long time. "This is, as far as we know, the oldest evidence of parasites manipulating the behaviour of their hosts and it shows this parasitic association with ants is relatively ancient and not a recent development. "Hopefully we can now find more fossilised evidence of parasitic manipulation. This will help us shed further light on the origins of this association so we can get a better idea of how it has evolved and spread."